The Ward Plaza, formerly Alonzo Ward Hotel, houses Roma Ristorante Italiano, The Ward Plaza Bar and Grill, Karisma Boutique and Labyrinth Films. Photo by Bernie Hunhoff. 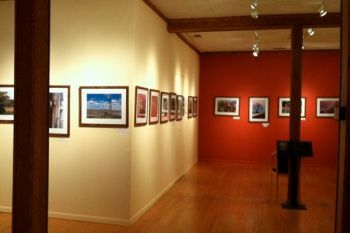 Dacotah Prairie Museum's Lamont Gallery features local and regional artists. Photo by Rebecca Johnson. The Dakota Central Telephone Company and Western Union exhibit at Dacotah Prairie Museum. Photo by Rebecca Johnson. Natural Abundance food co-op stocks organic produce, grass-fed beef, supplements, beauty products and much more. Photo courtesy of Natural Abundance. Aberdeen earned the nickname Hub City in 1911 because four major railroads operated there. The old train depot at Main Street and Railroad Avenue still houses Burlington Northern Santa Fe Railway, but art, shopping, and health care now make up some of the spokes on Aberdeen’s hub. My husband and I visited last November so I could attend a yoga workshop. We mainly explored downtown. First stop was Natural Abundance, the community food co-op in a corner shop on Main. “The co-op started as a private buying club in 1978 as a way to meet individuals needs for organic, whole and bulk foods,” says Lara Nelson, general manager. 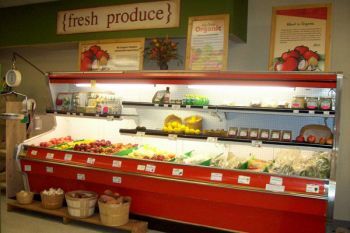 “Over the years it has evolved to be a full retail business.” The store has quite a variety of items – organic produce, grass-fed beef, supplements, health and beauty products are just a few. Thankfully for me, you don't have to be a co-op member to shop there. I grabbed a kombucha and some bananas then headed to the yoga studio. I had fun checking out Briscoe’s shop, sweating and learning with the guest teacher who taught the workshop. After a shower, my husband and I dined at Roma Ristorante Italiano. It’s located on the ground floor of the Ward Plaza, formerly Alonzo Ward Hotel. Raffi Ismaili and Tony Avdiu, half-Albanian and half-Italian cousins, opened the restaurant last February. Ismaili had been in the restaurant business for over 25 years, with restaurants in the Dallas/Fort Worth area, when Avdiu invited him to South Dakota. (Avdiu is also part owner of The Italian Garden in Brookings.) Roma offers a large selection of pasta, chicken, veal and seafood dishes. I tried the spaghetti marinara and my husband had cheese ravioli. Good food, inviting Italian décor and the servers were so attentive. Our water glasses were never empty. We explored the Ward Plaza a bit after we ate. 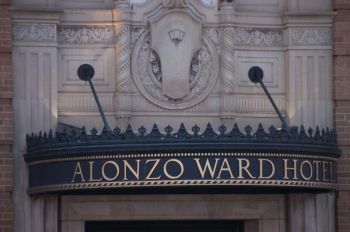 Alonzo Ward built the hotel in 1894. Fire destroyed it in 1926, but in 1928 he built again. Blackstone Developers renovated the building in 2004 and 90 of the hotel rooms were converted into 15 luxury condominiums. The original dark woodwork in the lobby and the chandelier in the Crystal Ballroom were fully restored. Ward Plaza houses two event spaces, The Ward Plaza Bar and Grill, Karisma Boutique, and Labyrinth Films. Seven hotel rooms remain, but they’ll be remodeled into apartments later this spring. Our next day’s lunch was at Red Rooster Coffee House, owned by siblings Dan Cleberg and Kileen Cleberg Limvere. They have a variety of sandwiches, soups and salads. We opted for the veggie burger, hummus sandwich and, of course, coffee. It was fun to relax in their mismatched, retro furniture and peruse local art on their yellow and orange walls. The Klebergs have been great leaders in Aberdeen’s cultural community by providing gallery space and hosting regular musical performances. They also sell used books and fair trade gifts like jewelry and scarves. Last stop on our trip was the Dacotah Prairie Museum. 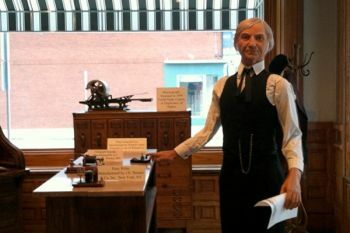 We especially liked the Dakota Central Telephone Company and Western Union exhibit, with its realistic looking mannequins. The Lamont Gallery upstairs was a real treat, too. It features the work of local and regional artists, with six shows each year. We admired photos by Michaela Glugla then headed home, happy having explored some of Aberdeen’s great places! Great article, please come back soon and explore some more! No Bucks in Aberdeen Beef?